First we need some historical perspective to understand the development and importance of Islamic calligraphy. Muslims believe the Quran is the word of God as revealed to Prophet Muhammad. The Quran, developed in the 7th Century, is the earliest known book written in Arabic and it played a key role in coalescing the Arabic language. Like European manuscripts, scribes wrote on parchment -prepared sheepskin. What is interesting about Islamic calligraphy is that Muslim scribes asked themselves what is a script worthy of the Word of God? So for the first three centuries of Islam, a style called Kufic was developed, based on strict geometric principles, with around 20 different variations. This angular style later gave way to the cursive Arabic scripts we are more familiar with and this sinuous script remains dominant to this day. It is important to remember that calligraphy’s function in religion is mainly due to the Muslim forbiddance of the representation of living beings. Over the centuries, as with other cultures, Islamic societies shifted towards a written rather than oral culture so calligraphic development intensified and became one of the most distinctive artistic elements of the religion. Islamic creativity and thought was thus expressed through calligraphy. This exhibition came into being because of a strong local element. Collecting Calligraphy celebrates a recent gift from longtime Cincinnati residents and active museum patrons, JoLynn and Byron Gustin. JoLynn was a docent at the museum in the 70’s at which time she fell in love with calligraphy. Curator Ainsley Cameron states: “This is the art form they both loved to collect together.” When the couple provided a gift of their Islamic calligraphy collection to the museum, it was an important moment to celebrate this gift and gather other works from the museum’s collection that spans nearly 80 years of effort. The result is this meditative exhibition. One of the most significant folios in this exhibition, according to Cameron, the exhibition curator when I interviewed her, is the seventeenth century Indian folio of Shah Jahan. The folio is important because the Shah collected these works in the time of their making, not after the fact. The works were circulated, read and revered in the Shah’s lifetime and he gathered the most important works for his personal folio. 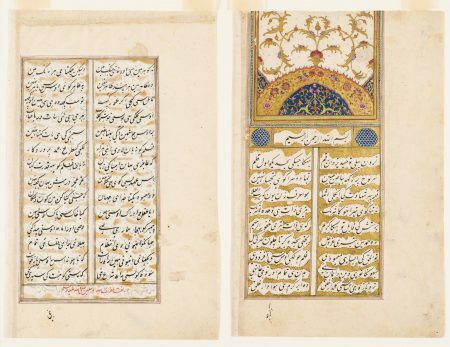 Interestingly, the Gustins approached their collecting of Islamic calligraphy from a historic perspective and it shows in such works as the Shah Jahan folio. One of its folio sheets from the 1600s has a wide border of flowers, so carefully observed and painted it is as if it were a set of botanical illustrations. In the center of this vertical format work, the text is in an ornate linear border and in contrast, the calligraphy dances and falls from upper left to lower right, falling like leaves in the autumn breeze. To complement this approach, Cameron approached the museum’s art works exhibited from a perspective of the artistic, looking at the dynamism of design and ornamentation. As such, she included the Album of Poetry (D’iwan), which inventively uses decoupage and paper cutting in addition to calligraphy. In looking at this exhibition it is clear that a vast array of styles developed as Islam spread across the globe, often reflecting the regional characteristics of societies where the religion took root. Verse Dedicated to Mughal Emperor Jahangir, from the Gustin gift, is such an example. Here, the calligraphy becomes lush lines dancing in space amid a delicate field of monochrome poesies. The interpretation of letterforms is so imaginative; the letters have impossibly long tails that create a pulsing rhythm throughout the composition. As the practice of Islamic calligraphy expanded even further afield, to China, Spain, India, Southeast Asia and West Africa, regional scripts emerged, less influenced by classical styles and formal geometric codifications. Both men and women could become calligraphers. They were some of the most highly regarded artists in Islamic societies. Over hundreds of years, lineages of highly skilled practitioners developed. As a result, calligraphy has a strong heritage based on the direct transmission of knowledge from one generation to another. 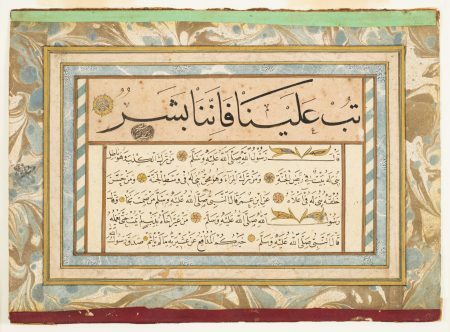 Collecting Calligraphy: Arts of the Islamic World includes individual folios and complete manuscripts that date from the ninth through the twentieth century. 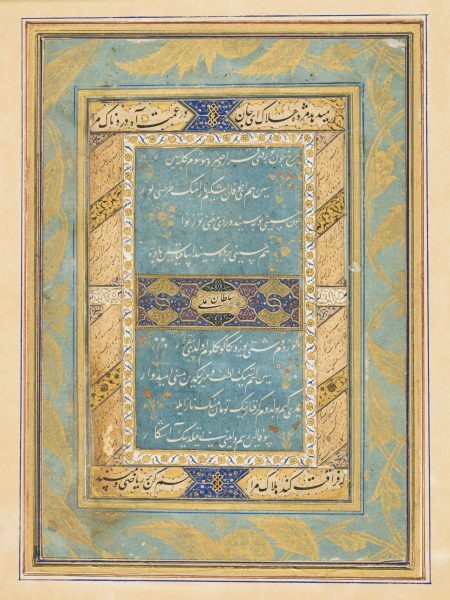 The artist/calligrapher made decisions about the paper size, the specific script, the choices for ornamentation and illumination (gold leaf) for each piece he or she created. The works on exhibit are from Iran, Turkey, India, Spain, and Syria. While in their time, these art works were instructive and inspiring. In our time, we witness an ongoing tradition of Islamic faith and can marvel at the dedication of the historic calligraphic masters and of the truly delicate beauty of their efforts. The temporary exhibition will be on view in The Manuel D. and Rhoda Mayerson Gallery and Sara M. and Michelle Vance Waddell Gallery (G124 and 125), across from the museum’s Terrace Café. Free admission. 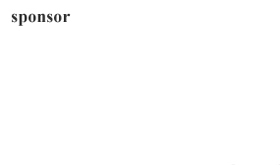 Photography is permitted.